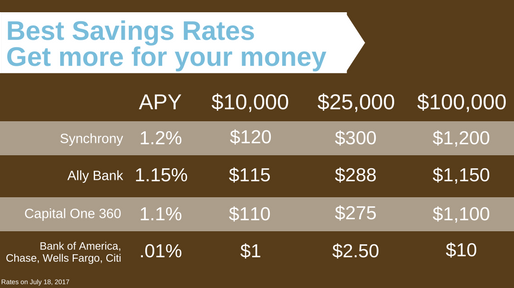 If you are looking for the best savings rates for your cash, online savings accounts win and it’s not even close. Online savings rates are over 1.1% now due to the Feds raising rates 3 times in the past 6 months. Have big banks increased their savings rates too? Nope. Interest rates at the 4 big banks remain at a microscopic .01% APY. 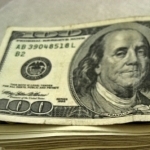 Do you have more than $1,000 cash in a checking or savings account at a big bank? If so, you are losing money by not moving it to an online savings account that paying 1.1% APY. What about CD rates? There are a few drawbacks to consider. One, CDs are not as liquid as a checking or savings account. Your cash is locked up for 6 months, 1 , 3, or 5 years. Two, CD rates are paying close to the same rate as online savings accounts. At Ally Bank, a 1 year CD is 1.35% APR while a 3 year CD is 1.6%. For most situations, you should have your cash in an online savings account for a period of five years or less. Disclaimer: These are not affiliate links and I do not receive any compensation from recommendations. My advice is objectively provided here based on rates from July 2017.